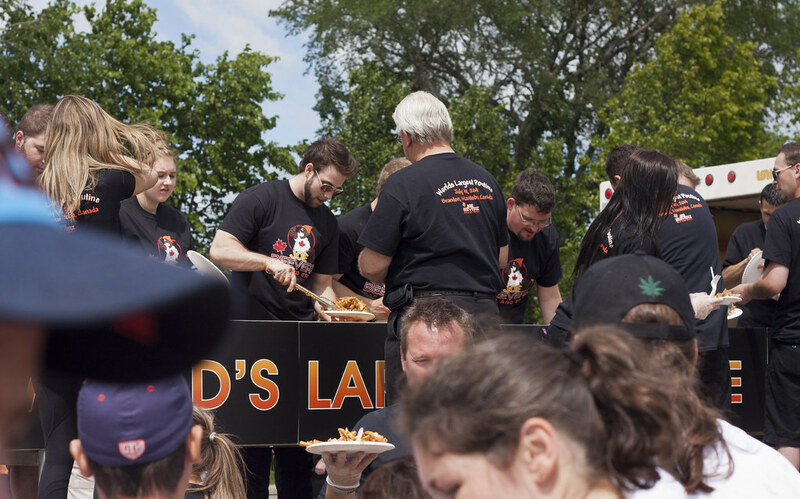 Brandon restaurant breaks the record for "World's Largest Poutine"
It's been way too long since I've been on here, I've been mainly blogging about beer. 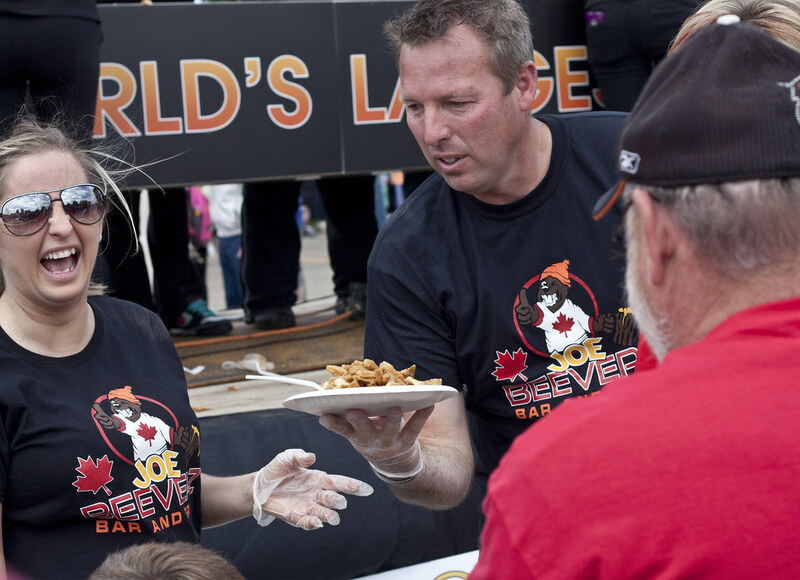 Back on Canada Day, Brandon hoser-themed bar Joe Beeverz wanted to break the record of the World's Largest Poutine, which was previously something like 1400lbs done in Saguenay, Quebec. Joe Beeverz not only broke the record, but exceeded it by something like 500lbs! I was there for the event - it was scheduled from 2-4PM on Canada Day but by right after 3PM - it was ALL gone already! Well, what do you expect? Myself - I had probably 3lb of the poutine alone! 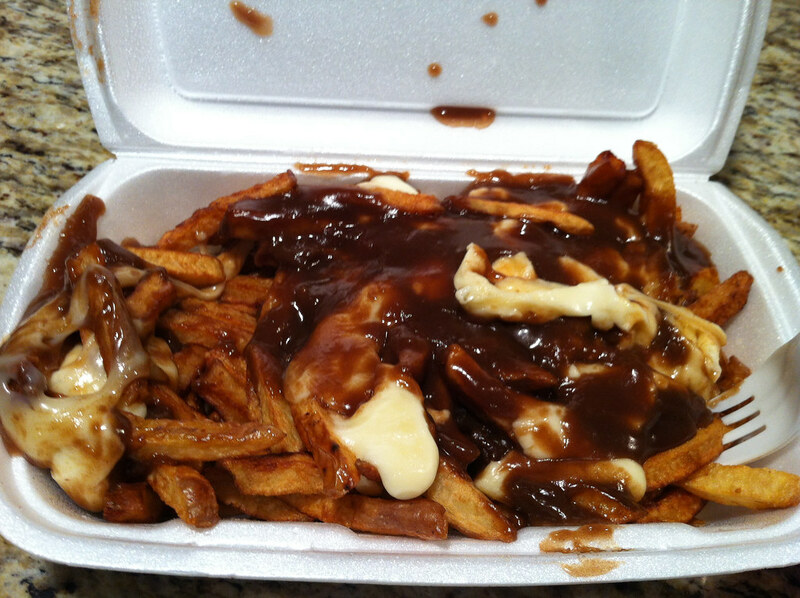 I think Brandon may one day become the poutine capital of Manitoba, but first we need some Francotobains to show how it's really made. The BEST poutine I've had in Manitoba was at, of course, a Francophone restaurant - Le Garage in Saint-Boniface. I've had more than my share of poutine in Brandon and while it's a serious comfort food, I've never felt "OMG THIS IS AMAZING" before, but Joe Beeverz has a poutine menu of something like 13ish different poutines so props to them for experimenting with poutine! I was in Winnipeg a few weeks ago for yet another job interview (for a position I didn't end up getting), while in Winnipeg I usually stay with family in Birds Hill Park, a 20 minute drive east of Winnipeg. Close by Birds Hill Park is the town of Lockport, which is famous in Manitoba for having the St Andrews Lock & Dam. Also, Lockport is known for having a wide variety of diners, burger stands and fast food joints for such a small community, though much of it has to do with its proximity to Winnipeg. One popular restaurant is Half Moon Drive In, a 60s themed diner that serves burger, fries, hot dogs and ice cream. 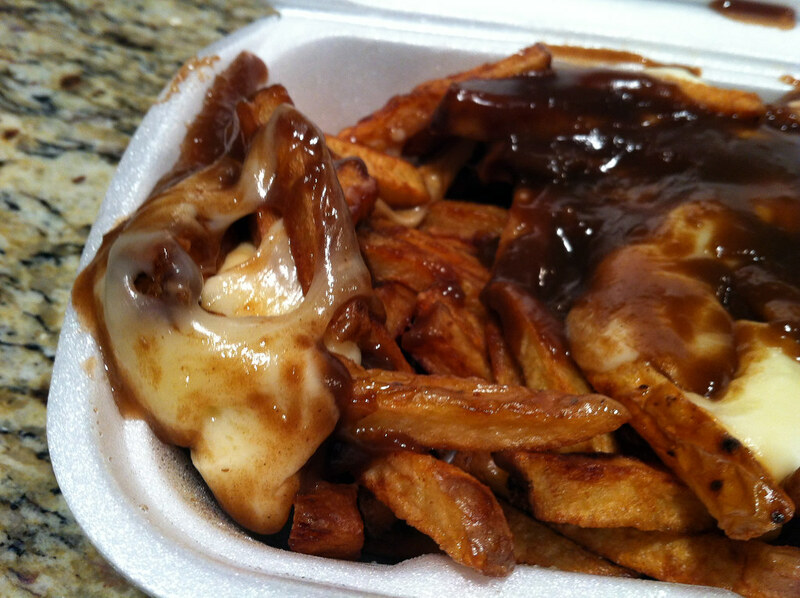 I first heard of Half Moon Diner back in 2009, it was the very first non-chain restaurant in Manitoba that I heard used curds for their poutine rather than shredded cheese - as shredded cheese was (still is) the norm for Manitoban eateries. It took me until September to finally give Half Moon a visit. I made the 15 minute or so drive from Bird's Hill Park to Half Moon, I wasn't particularly hungry but I needed to finally try their poutine already. 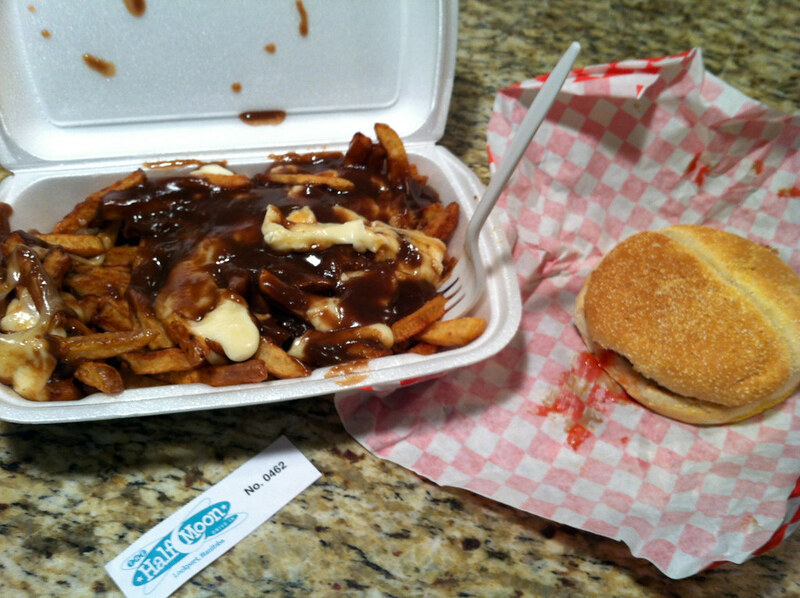 I ordered a hamburger and poutine. After a 10-15 minute wait, I took the poutine and burger with me back to Bird's Hill Park.... the drive felt 3x longer than usual. The decor at Half Moon was a nice 60s themed diner, yet looked like it was renovated within the past few years, a nice clean look compared to some other 60s themed diners in this neck of the woods. The aroma of a freshly grilled burger and the yumminess of the potato/gravy/curd mixture was a bit overwhelming to my gut on the 15 minute drive, I just wanted to eat it then and there. As you know, it's best to eat your poutine ASAP, so a 15 minute drive wears down a poutine a bit by melting the cheese and softening the fries, but hey.. it was still going to be good! 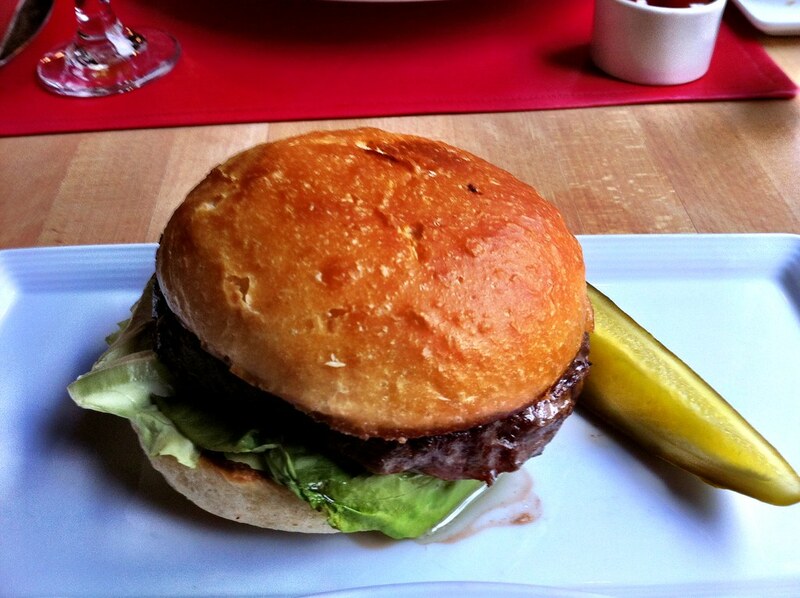 I started off by eating the burger, which had a powerful flame broiled aroma, and boy.. it was tasty! My gut kept telling me "hurry up and eat that damned poutine already!" 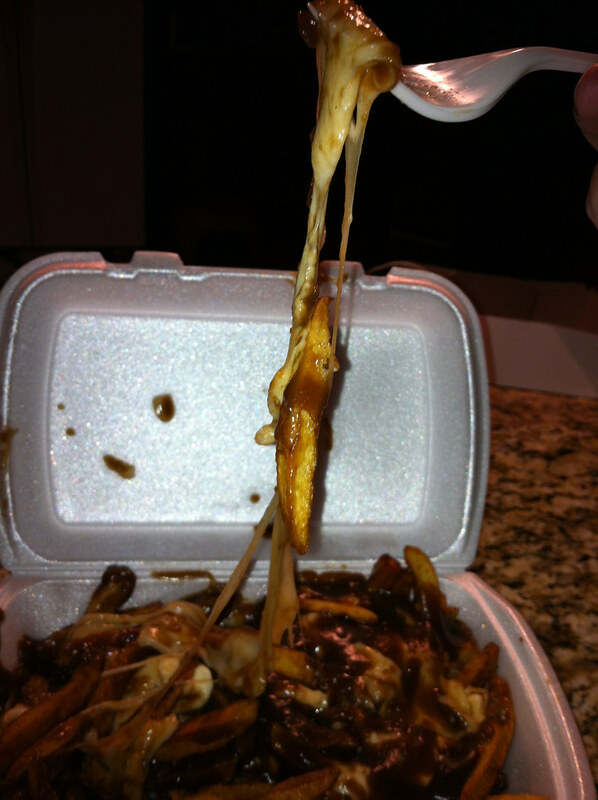 Holy eff.. the poutine must have weighed at least two pounds in its styrofoam container. It was enough poutine for 2.5 people, and I wasn't even that hungry.. but I never waste poutine, even if it's a bad one. The mountain of poutine had fresh home cut fries, a thick dark brown beefy gravy and a nice helping of squeaky white curds (I'm assuming they're Bothwell Curds). For the $5.50 or so that the poutine cost, it was a lot of poutine for your buck, which is always a good thing. The fries were a bit soft and mushy though instead of crispy, though that could be my fault by leaving it in its styrofoam container for 15 minutes before eating it. The gravy, incredibly thick, dark brown and a bit beefy was your average poutine gravy, similar to fast food-style gravies such as Burger King's and A&Ws gravy - a bit of a soupy taste to it, but unlike the fast food poutines, the thick gravy held everything together instead of acting like a watery soup. The curds.. by the time I opened the container, it was a thick gooey curdy mess. Most people who prefer shredded cheese in their poutine over curds generally prefer it because of the gooey texture the cheese gives off.. well no shredded cheese "poutine" can match this, the curds had the nice squeak that a fresh curd should have, plus a great amount of stringiness that could stretch miles without snapping! As I was eating the poutine, I quickly found that I could not possibly eat the entire poutine, but.. hey.. I did it! It was sure more poutine than I am accustomed to eating, especially with trying to "diet". Overall, it was money and a drive well spent! Affordable, friendly staff, great atmosphere, and not to forget a delicious poutine - I was impressed by Half Moon and I'm looking forward to another poutine food baby next time I'm in that neck of the woods. 3rd Annual World Poutine Eating Championship - This Weekend! 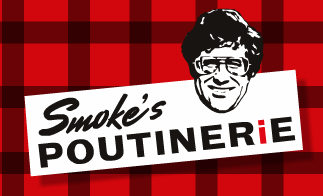 If you're lucky enough to be in Toronto this weekend, September 15th, Smoke's Poutinerie is holding the Third Annual Poutine Eating Championship. 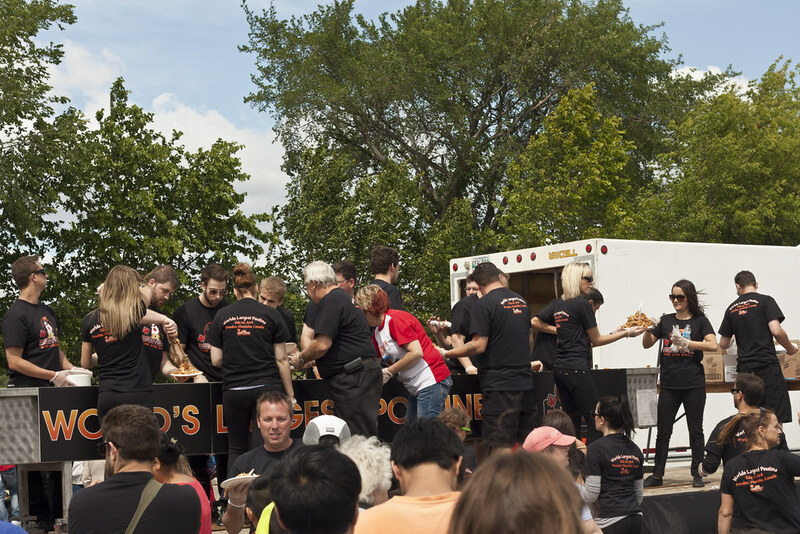 While you don't have to partake in eating as much poutine as possible (and possibly getting clogged arteries from it), they will be offering free poutine during the entire event! The event is free, so if you're in Toronto.. check it out, or whatevs. Who would have thought that I would, one day, have a poutine outside of Canada, in USA none-the-less? I went to the North Dakota State Fair in Minot, ND and the fried curd stand was selling poutine - obviously for the Canadian tourists like myself, as well as for those looking to try new foods. If you have never had deep fried curds before, they are quite similar to mozzarella sticks, cheesy, battered and fried. Fried curds are generally greasy as heck, so a few will taste like heaven, but a whole bunch will give you a bad heartburn, but food that's bad for you tastes oh so good! The curd stand used their fried curds as part of the poutine, which is a first for me, I've never had fried curds ON a poutine! The fact that it uses curds instead of shredded cheese is still serious brownie points. The fries are the standard not-quite-shoestring-not-quite-steakcut fries that you can get at your local Supermarket's freezer section, pretty bland. The gravy is light, minimal but is a nice sauce with a bit of beefiness to it, as well as a slight spice to it, while light, it really works for this. Last of all, the curds - deep fried curds. I've had poutines with curds, shredded cheese, cheese sauce and now, curds - but deep fried! 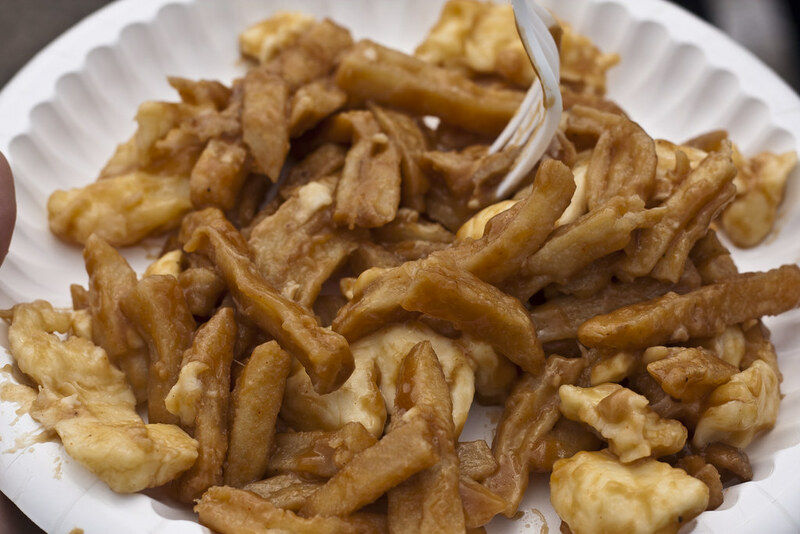 The curds have a very noticeable amount of squeak, so it's obviously fresher than curds you generally get at a poutinerie, fast food joint, pub or diner. The curds are greasy and salty the more you eat the poutine, but hey.. you don't really notice the deep fried aspect of the fries, except for a crunchy texture while biting. Overall, put it all together - this actually is a solid poutine. It cost $8 but considering it was my first meal of the day, and while pretty small portion, it was incredibly filling. The fries were the downside, but combined with the fried curds and gravy - it actually works pretty well. I also got to snack on mini donuts and pulled pork sandwiches while down there, I wish I snacked on more different foods, but money doesn't grow on trees and I really didn't want bad heartburn, which happens every time I go to the States. I'll be going to ND State Fair next year, so I hope it makes an appearance again! Hey look, poutine is finally getting recognition by more of the big players in the fast food market today! 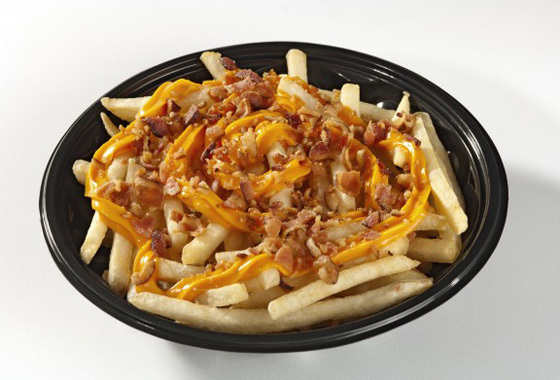 Wendy's recently launched a petition, or as they call it - a poutition to make poutine the national dish of Canada. You can sign the petition poutition at Poutition.ca - but it requires you to have Facebook account - booooooo! I signed the poutition, which gave me a coupon for a free combo upgrade to poutine, so here we are.. time for another poutine review! In the last two years, Wendy's has been revamping their menu and completely changed several of their classic items, including - skin-on fries with sea salt, and thicker hamburgers with butter toasted buns.. mmm... but poutine? That's an entirely new field for Wendy's. Since I got a free combo upgrade, I excitedly wanted to try Wendys' new poutine. Ordering it was a bit of a challenge as the staff at the Wendy's weren't sure what to do with the coupon. After a few minutes of frustration on their part, they were able to put it through for free. The combo consisting of a double hamburger on a butter toasted bun (om! ), a Coke (free refills!) 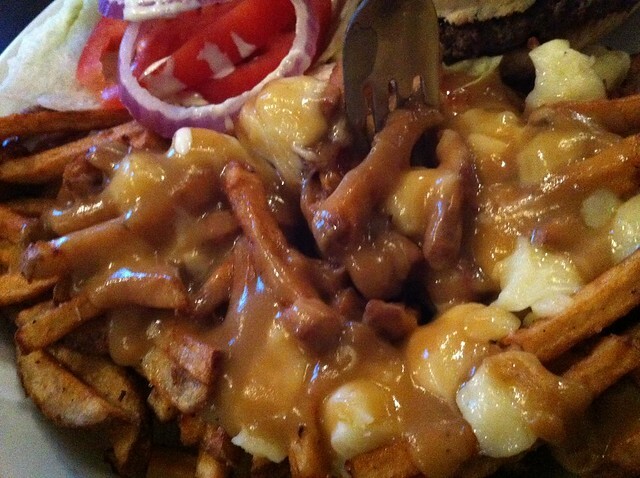 and of course, the poutine. The combo cost a bit over $8, quite pricey but for quality, I'd rather get that than a McDouble combo at McDonalds. The poutine arrived quite quickly. The fries were fresh from the frier, so they were hot, steaming, crispy on the outside, fluffy on the inside. The gravy, on the other hand was luke warm, just warmer than room temperature. The gravy itself was quite mediocre as it's nearly identical to the gravy that's also found at A&W and Burger King, a bland and salty "sauce", peppery and slightly beefy - very minimal gravy. That said, it's not a soupy mixture like either BK or A&W's, it was thicker and held with the rest of the poutine fine, instead of making everything soggy. 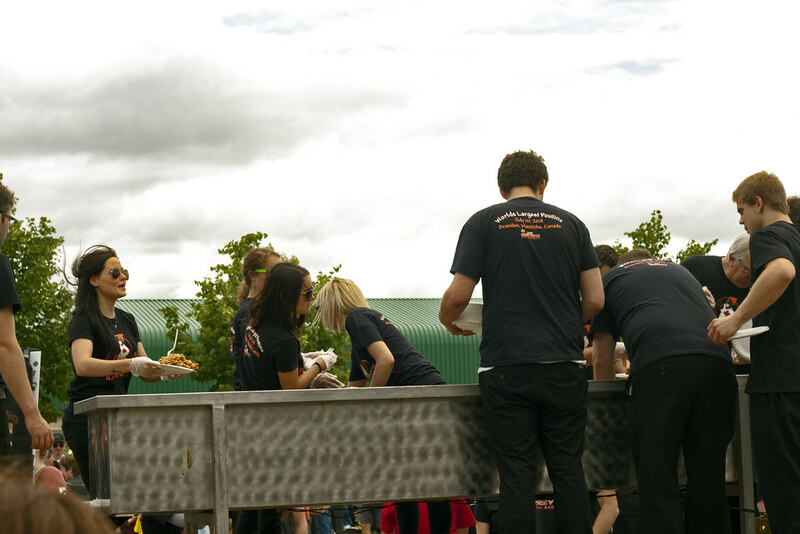 The curds were your standard fast food curds though there was a decent amount of squeak going on! I appreciate a good squeak in the curds. Overall, it was your average fast food poutine. I appreciate that Wendy's is trying to push for a finer fast food experience. I haven't had a bad meal at Wendy's since before they changed their fries. Prior to the skin-on fries, it was more likely than not that I would receive a batch of ice cold fries, but now.. always piping hot and fresh! Less salt too and just generally decent. If they had used the old fries for the poutine, I would have written off this poutine completely. Remember to sign the Poutition! One of the newest restaurants in the Exchange District of Winnipeg is Peasant Cookery. Oddly enough, Peasant Cookery is located right across the street from Smoke's Poutinerie so while I was waiting for my meal, I could see Smoke's face staring at me the entire time! Peasant Cookery has quickly become a hotspot for omlicious food. I went in with a friend and we both ordered a burger, poutine and beer. Each meal came out to just over $25. The poutine was a nice helping of fries, a light light gravy and melted curds. Let's start off with the fries. I'm not sure what oil they were cooking them in, but it gave them a nice taste to them. They were perfectly crispy on the outside, as well as nice and fluffy on the inside. The gravy was a light brown sauce, and I couldn't put my finger on it, but reminded me a bit of a bacon taste, in a good way! The gravy is a bit warm to the lips, and the warmth remained for hours after eating this poutine. La fromage.. The curds were the only negative to it, as they melted the curds with the rest of the poutine, which made it go from a mountain of curds everywhere to a one big melted curd stuck to everything. That said, the cheese was delicious, bit salty and very very squeaky like fresh curds should be! Honestly, this may be the best poutine I've had in Manitoba. Every single bite I took, I kept saying "OMG THIS IS SO GOOD!" and my friend agreed too! For $7.99, this poutine can't be beat at that price range. I also had a burger ($8.99) which was a mixture of short rib, brisket and chuck meat, all combined into a patty I swear was at least half a pound. To top it all off, it came on a freshly baked brioche roll. The combination of the meat gave the burger a nice beefy goodness. All in all, it was more than worth the price.. heck.. I'd pay $5 more per item as it was that good! The atmosphere at Peasant Cookery has a bit of a chicness combined with a rural country farm house. I recommend this for a bite to eat if you are looking for a new place to check out in Winnipeg, for a business lunch or for a date. I rate the poutine 4.5 curds out of 5. Honestly, I have never had a poutine that good in my life. The combination of amazing home cut fries cooked in an I-dont-know-what-that-is oil, great light sauce and fresh squeaky curds. Nothing wrong with a winning combination! Le Garage has been on my Poutine bucket list since April 2009, when a friend of mine told me that she had one of the best poutines in her life there. It took me nearly 3 years but I finally went to Le Garage, which is in the heart of French Winnipeg in Saint Boniface. I went in not knowing what to expect. The atmosphere was quite nice, a nice roomy restaurant with lots of sitting space. I ordered a petite poutine with a hamburger and a beer which I swear was Coors Light. The burger was quite tasty, had a very homemade taste, not sure what to say, but nice richness in the beef, great bun, very hard to put down! The poutine came with thin fresh homecut fries, nice and hot - but some of the fries were actually quite cold. The sauce was your usual poutine sauce, a bit similar to what you can get at a grocery store (ie McCormick's poutine sauce), but better and for some reason had a bit of sweetness like ketchup to it. The curds were your standard white cheddar Bothwell curds. I find Bothwell curds generally too large for a poutine, but they were consistently decent bite size in this cae. I had some black burnt fries in my batch of poutine, but it didn't bother me as they were at the very bottom and very noticeable. The sauce was warm, but not hot, but had a nice thick consistency - not chunky and not watery. Watery poutine quite often ends up being a mess. For it being a petite poutine, it was VERY plentiful amount, you get a lot of bang for your buck. 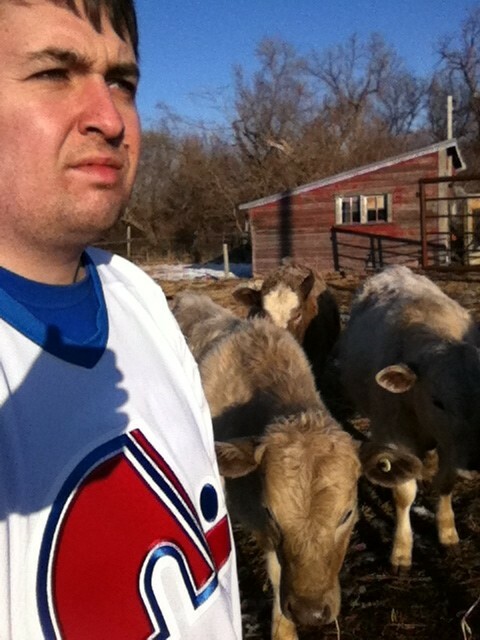 I give this 3.5 curds out of 5! I paid $20 before tax/tip for a petite poutine, hamburger and a beer that I assume was Coors Light. Their beer selection was pretty minimal for on tap as they didn't have Half Pints' Little Scrapper IPA on tap. Lovey's BBQ - I've heard good things about their poutine. Also the idea of pulled pork & poutine = ommmmmmlicious! Half Moon Drive In - This isn't necessarily in Winnipeg, but a Flickr friend once recommended this eatery in Lockport, Manitoba, so it's obviously on my list! 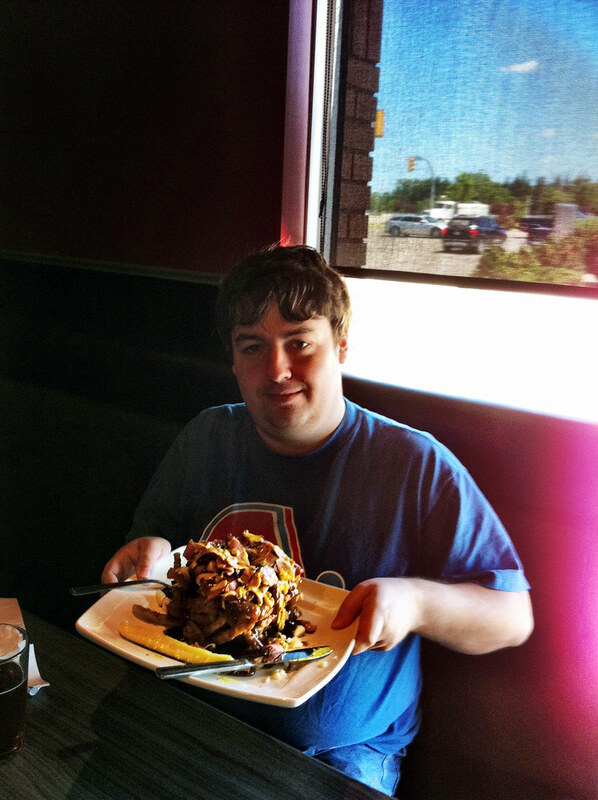 Whatever new poutine Joe Beeverz has - Joe Beeverz in Brandon likes to do a crazy poutine each month. For a few months it was the Hangover Poutine which was topped with bacon and eggs. I've frequented this place quite a bit in the past, but always looking forward to their next poutine. Heck, they need a permanent poutine menu! Still rated as the best poutine I've had in Manitoba so far! My list isn't longer as my stomach hates me now days, but I'll try each and every one of those restos soon enough! The folks at SavourWinnipeg did a 12 Try Before You Die list of poutines around Winnipeg, and I'll be checking them out, as should you! 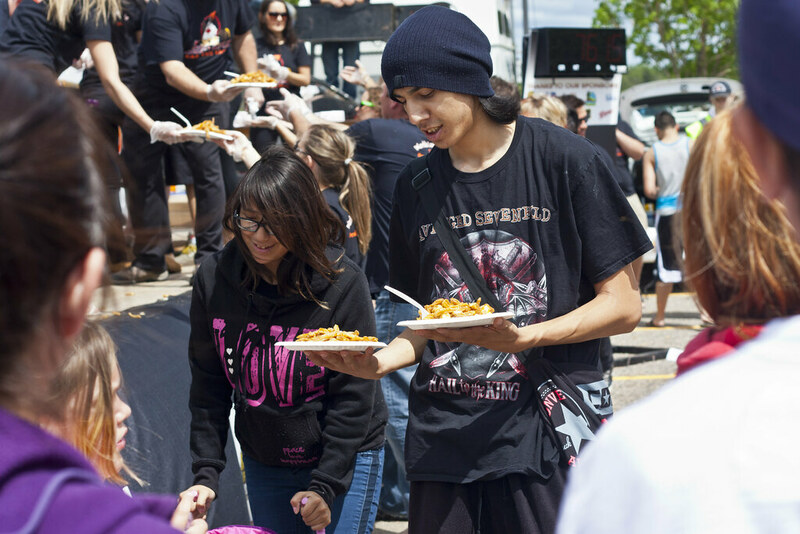 If you're as big of a fan of poutine as I am, then you are familiar with le festival de la poutine that takes place every year in Drummondville, Quebec. 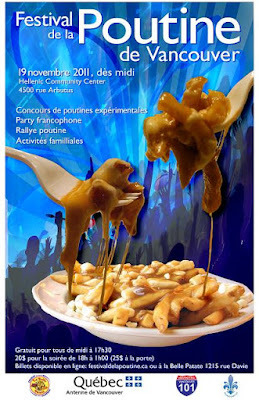 Now folks in Vancouver, BC are doing their own take on it with the Festival de la Poutine de Vancouver. The poutine festival is taking place on November 19 at Hellenic Community Centre at 4500 Arbutus St in Vancouver. The event includes a poutine crawl, where you get to try various poutine from Vancouver poutineries, poutine cook-off, all you can eat poutine (yum!) and even some live music. The cost is $25 for evening festivities, but free for the afternoon. Sounds like a poutine fun time!